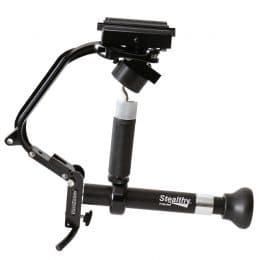 The Stealthy is a unique, high quality stabilizer for video cameras. 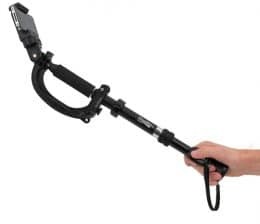 Its patented engineering allows an operator to switch back and forth from a tabletop tripod, 3-point shooter, camera stabilizer, short monopod stabilizer, or long monopod (sold separately) quickly and easily. 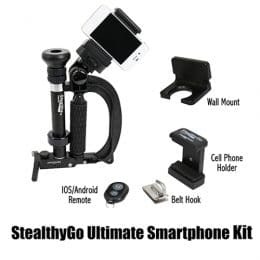 Stealthy™ is specifically designed to hang from your belt clip when not in use and can be quickly drawn up for capturing shots at a moment’s notice. 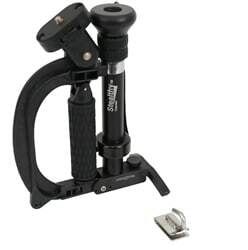 This ground breaking handheld camera stabilizer is offered at a price that is affordable for both amateurs and experienced film makers alike. 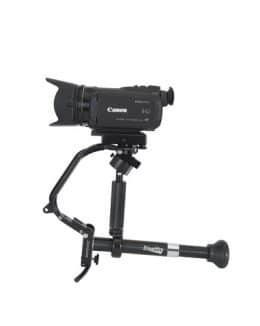 Easily switch from tabletop tripod, 3-point shooter, camera stabilizer, short monopod, or long monopod (long pod sold separately). When not in use, comfortably hang the Stealthy from your belt with the included belt clip. The Stealthy’s ability to quickly convert between multiple support points makes it one of the most popular and versatile film accessories on the market, and it is available in 3 variations.